Chris Samnee: Wizard World Chicago: Creature! 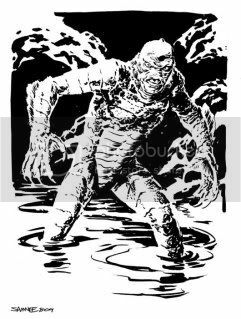 If they ever end up remaking the Creature films I'll shed tears. I haven't decided yet if they'll be tears of joy yet or not though. Seriously, best movie monster design EVER! It'd take a lot of work to top this guy's look. While I've really enjoyed your previous postings of pieces featuring the Creature, this one is my favorite of the bunch. You've totally played up his anthropomorphic fish-like qualities to great effect. I'm envious of whomever landed this beauty. Your best rendition of the Gill Monster ever. It would take a lot of work to top THAT drawing! Thanks so much, Mr. Lieber. I really appreciate it. Glad you dig it, Craig. Guess I'll have to try extra hard on the next one. The Mighty #7 on stands today!! "Can you read my mind?"